We couldn't get away from each other when I was growing up, my brothers and I. Small ranch house. Big Catholic family. So, we built forts. Blanket and card-table forts in the living room. Rickety wooden forts in the crooks of the apple and willow trees. Forts secreted in the dense underbrush of the fencerows delineating neighboring wheat and cornfields, where we huddled together to smoke Dad's Marlboro cigarettes and plot our worldly travels. Bryan Thompson's fort was much better than any of ours. He drew his fort when he was 6 and it had wheels. And then he drew it over and over and over again. Until he convinced Airstream to build it. It's called the Nest, and it's beautiful. I have something to live for again. I say "again" because back in 1998, I owned my own tiny wheeled fort — a 13-foot 1951 Boles Aero, a droopy, riveted sheetmetal egg on two wheels. It's amusing to compare my goose egg to Thompson's elegant fiberglass Nest. "Think about an egg," he says. "There's nothing more pure than an egg. But trailers that are called eggs never really have that tension and timelessness and I wanted to give them that." My "egg" also didn't have any room inside. My husband and I could cram together in the tiny bed made from the turquoise Naugahyde bench seat, if one of us agreed to put an arm up in the air all night. It had an icebox. As in, a metal box that held a block of ice below the beer. The thrill was gone after a year, and we sold it on eBay. I've pined for it. From a distance, of course. Now I can dream about the Nest. Here is how the first fiberglass trailer in Airstream's 89-year history came to be. Dropped out of college, gone to Europe and lived for a year in a little hobbit house of a camper trailer the Euros call a caravan. Knocked on the door of every car design studio until Fiat's design director, Peter Davis, took pity, spent the afternoon with him in Turin, Italy, and told him that he had what it took to be more than just a product designer. Landed a summer internship at Peugeot in 1997 and at Citroen in 1998. Graduated with an Industrial Design degree from the College for Creative Studies in Detroit. Worked for a decade at Nissan Design America in San Diego, where he designed, among other products, the Nissan NV van and the Titan interior. Built an extraordinary freelance design career with clients such as Embraer Jets, Volvo/Mack Trucks and, yes, Airstream. Wrote a fresh design blog for Bravo TV for three years in which he discussed his Greek neighbor who lived with his mother and a yard full of Fiat X1/9s and pink flamingos, his love affair with Japanese cars (the rare Datsun Honey Bee in particular) and, of course, his love affair with mobile living. "I have a confession to make," he wrote. "When I see a trailer park, I have to check it out." Helped design Katy Perry's throne for her "Roar" video. Owned two wacky 1990 Nissan Paos. The first was in Japan, where he left it in a parking lot with the keys in the ignition when he was called back early to the States. The second he owned in the States, despite it being a noncompliant Japanese model that he could neither register nor drive. He donated that one to the Lane Motor Museum in Nashville. Found his original Toyota Tercel Wagon (one with the blue plaid upholstery and giant windows) online, tracked down the owner who told him it was in a ditch, drove from San Diego to Idaho in the dead of winter and had it pulled out, then fully restored it. He is more than a Renaissance man. He is a force of nature, a man always on a mission. The happiest man in the world who laughs the entire time he is talking. It was clear to him that Airstream had to build his dream. Maybe not so clear to them. Thompson was already in the thick of it with Airstream. He'd sent them a letter in 2000, along with a box of handmade Nest-like models that he'd built to really get his ideas across. No one replied for three years — three years! — until Dicky Riegel became Airstream's president in 2003 and found the letter and the models jammed in the drawers of his predecessor's desk. Riegel and CEO Bob Wheeler got on a call to Thompson, whom they invited to the opening of an Airstream diner in Beverly Hills later that year. Thompson created a fresh, new scale model, wore his best chrome-plated skintight pants and made the presentation in person. And thus the relationship between Nissan and Airstream was born, with Thompson leading a multitude of design programs — just not the Nest. 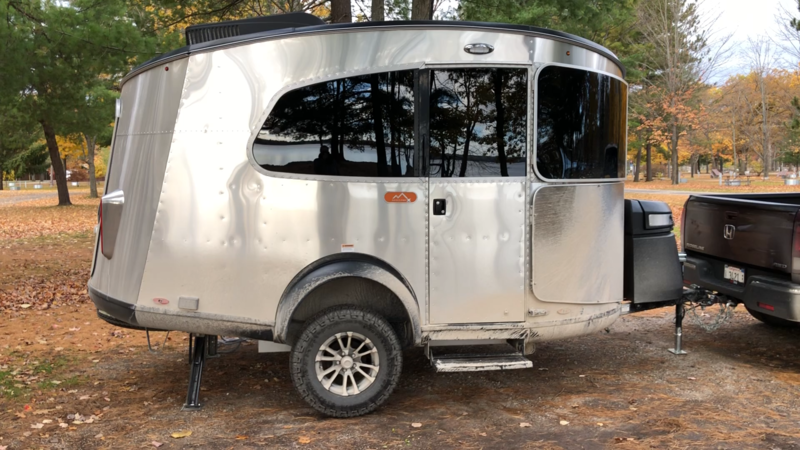 Instead of green-lighting the Nest, Airstream then gave Thompson's NDA design team three trailers to use as temporary color and materials studios, which the NDA team hooked up to Xterras for a cross-country "inspiration tour." "It was amazing, and invaluable for our ongoing work on autonomous vehicles," says Thompson. But he was no closer to his dream. It took a tip in 2012 from the boss of Chiat Day, Nissan's agency, about a company in Oregon called Nest Caravans to give Thompson his one last shot. The Portland firm had designed a fiberglass trailer very much like Thompson's basic Nest concepts. He called the designer, Robert Johans, and offered to redesign it for them. "He didn't hang up on me," Thompson laughs. "So I redesigned the Nest for them with the proper DNA and sensibility to become the Airstream it was meant to be. "One of the hardest things to do with a trailer is to give it a stance because it is a box. It's very tall and it's tippy." Fiberglass allowed Thompson to use car-design tricks, such as giving the trailer an undercut to allow the creation of wheel arches, a bit of visual fakery to give the Nest a stance. "Like the wheels are more planted than they really are." He copied the rear-door entry from the Basecamp, and wrapped seven windows around the perimeter, including a huge panorama window across the front, with a large skylight up top. The clever step up in the rear roofline is Thompson's homage to the Nissan Xterra, one of his favorite Nissan wagons. "But a roof rack would make it tougher," he says. "It would really complete it. Mine will have one!" It's easy to believe Thompson when he says, "I've never had a project so close to my heart as this trailer." After he helped Johans with the redesign, Thompson then convinced Airstream in 2016 to buy the whole company. The Airstream Nest went on sale this past April for $45,900. Jean Jennings has been writing about cars for more than 30 years, after stints as a taxicab driver and as a mechanic in the Chrysler Proving Grounds Impact Lab. She was a staff writer at Car and Driver magazine, the first executive editor and former president and editor-in-chief of Automobile Magazine, the founder of the blog Jean Knows Cars and former automotive correspondent for Good Morning America. She has lifetime awards from both the Motor Press Guild and the New England Motor Press Association. Look for more of her Vile Gossip columns in the future.